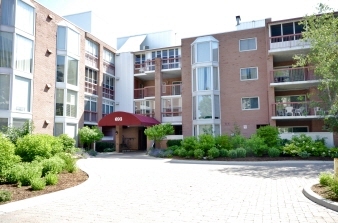 Welcome to this extra large apartment condo in a preferred top floor location. Southwest exposure in the quietest corner of adult community. Contemporary design features, large principal rooms, beautiful office/den area that opens to private patio, enclosed and covered balcony. Beautiful updated Kitchen includes all appliances. Each Bedroom features dedicated ensuite. Secure underground parking & ample visitor parking. Next door to Thames walking trails, close to Western, University Hospital, city bus, off leash dog park & Masonville Mall. Other features include gorgeous laminate floors, convenient ceramic tile, party room plus guest suite. Low maintenance heat pump with central air. Note fireplace not currently i working order.